The Immunization Action Coalition (IAC) has presented its inaugural IAC Becky Payne Award to the national immunization nonprofit Vaccinate Your Family (VYF). VYF works tirelessly to protect families and individuals from vaccine-preventable diseases. It is particularly effective at using social media to raise awareness of the critical need for timely immunization, increasing the public’s understanding of the benefits of vaccines, and increasing confidence in the safety of vaccines. VYFs Facebook page has nearly 200,000 followers and its popular Shot of Prevention blog reaches approximately 70,000 monthly visitors. Overall, the organization reaches nearly 11 million people annually with social media messages. Headquartered in Washington DC, VYF educates legislators on current issues surrounding vaccine safety. It also plays a central role in coordinating the efforts of federal, state, and local vaccination advocates working on the shared goal of raising immunization rates across the age span. “All of us at Vaccinate Your Family are honored by this selection as the first recipient of the IAC Becky Payne Award. Our board of directors, including co-founder and president Rosalynn Carter, were deeply moved as our relationship with IAC goes back 20 years and we hold them in the highest regard. We look forward to continuing to work closely on increasing vaccine uptake nationally,” said Amy Pisani, VYF executive director. On December 1, Robert R. Redfield, MD, director, Centers for Disease Control and Prevention, released statement titled CDC Director’s Statement on Life of Betty Bumpers. The complete statement is reprinted below. CDC today celebrates the life of one of the greatest heroes of public health America has ever known—Betty Bumpers. As First Lady of Arkansas, Mrs. Bumpers was shocked to learn that her state had one of the lowest childhood immunization rates in the Nation. Her “Every Child by '74” immunization campaign brought together partners from government, academia, and the private sector. Her state soon had one of the highest immunization rates in the United States. Access Dr. Redfield's statement online: CDC Director’s Statement on Life of Betty Bumpers. Mrs.Bumpers's memorial service is archived online. Amy Pisani, Vaccinate Your Family executive director, eulogizes Mrs. Bumpers starting at 39:23 min. On December 6, AAP News published an article titled Infant ibuprofen recalled. The text is reprinted here in full. Reprinted with permission of AAP News, Dec. 6. Three lots of infant ibuprofen have been recalled due to potentially high concentrations of the drug. Tris Pharma Inc. has recalled Ibuprofen Concentrated Oral Suspension, USP (NSAID) 50 milligrams per 1.25 milliliters. The medication was sold in 0.5 ounce bottles under the Equate, CVS Health and Family Wellness brands at Walmart, CVS and Family Dollar stores, respectively. Additional details on lot numbers and expiration dates are available at https://prn.to/2rmfqTn. No adverse events have been reported to Tris Pharma Inc., but the higher potency could cause nausea, vomiting, diarrhea, tinnitus, headache and gastrointestinal bleeding, according to the company. Infants may be more vulnerable to permanent kidney damage. The CDC-sponsored webinar titled "#HowIRecommend Flu Vaccine: How to Make Recommendations that Matter to Patients. "webinar was postponed in observance of a national day of mourning for President George H. W. Bush. The new date is today, December 12, at 2:00 p.m. (ET). Please remember to register again. This webinar will assist healthcare professionals with making recommendations and addressing important questions from patients. IAC's Clinic Tools: Administering Vaccines web page on immunize.org is the "go-to" place for resources on vaccine administration, making it easy to find a wide variety of educational materials, resources, and tools related to vaccine administration from IAC, CDC, and other IAC partner organizations. This web page can be found by selecting the "Clinic Tools" tab (third from the left) in the light blue banner across the top of every immunize.org web page and then selecting "Administering Vaccines" in the drop-down menu. In the left-hand column of the page you will find IAC's educational materials related to vaccine administration. From here, you can access handouts and standing orders templates, as well as links to other related resources available on immunize.org. The right-hand column of the page includes resources from CDC and other partner organizations. For example, the second resource listed under CDC, the Vaccination Administration Resource Library, brings readers directly to the web page with CDC's e-Learn 18 vaccine administration video clips. These video clips, ranging from around three to nine minutes in length, have been excerpted for quick access from the e-Learn course. In this column, additional vaccine administration educational resources can be accessed from other IAC partners as well, including the Alliance for Immunization in Michigan, California Department of Public Health's EZ-IZ website, and the American Academy of Pediatrics. Visit the Clinic Tools: Administering Vaccines web page on immunize.org. The American College of Physicians (ACP) is offering a new online resource called the Adult Immunization Resource Hub. This resource was developed as part of ACP’s I Raise the Rates initiative to assist physicians and their teams to assess, understand, and improve adult immunization rates and patient outcomes in their clinical settings. I Raise the Rates is a collaborative, data-driven campaign to support patients, physicians, healthcare teams, systems, and communities in raising adult immunization rates and reducing vaccine-preventable diseases. The program seeks to assist internists and other primary care providers in both understanding the immunization rates of their patients and making practice changes that promote immunizations. Access ACP's Adult Immunization Resource Hub. November's column is titled CDC's Vaccine Administration Training Materials – A Great Collection of Four-minute Videos and Web-based Training Programs and is reprinted below. Vaccine Administration e-Learn—Just scroll down the page to Vaccine Administration and click on the link to access the self-paced course that provides comprehensive training using videos, job aids, and other resources. You Call the Shots—An interactive, web-based immunization training course that includes the latest guidelines and recommendations in vaccine practice. The Honor Roll now includes 424 birthing institutions from 40 states, Puerto Rico, Guam, and an overseas U.S. military base. One hundred two institutions have qualified for two years, 45 institutions have qualified three times, 22 institutions have qualified four times, ten institutions have qualified five times, three institutions have qualified six times, and one institution has qualified seven times. The December 7 edition of the WHO periodical Weekly Epidemiological Record reported on the October 2018 meeting of the Strategic Advisory Group of Experts on Immunization in an article titled Meeting of the Strategic Advisory Group of Experts on Immunization, October 2018—Conclusions and recommendations. The National Foundation for Infectious Diseases (NFID) has developed a new online toolkit to increase awareness of the dangers of influenza in U.S. adults with chronic health conditions and the importance of annual vaccination. 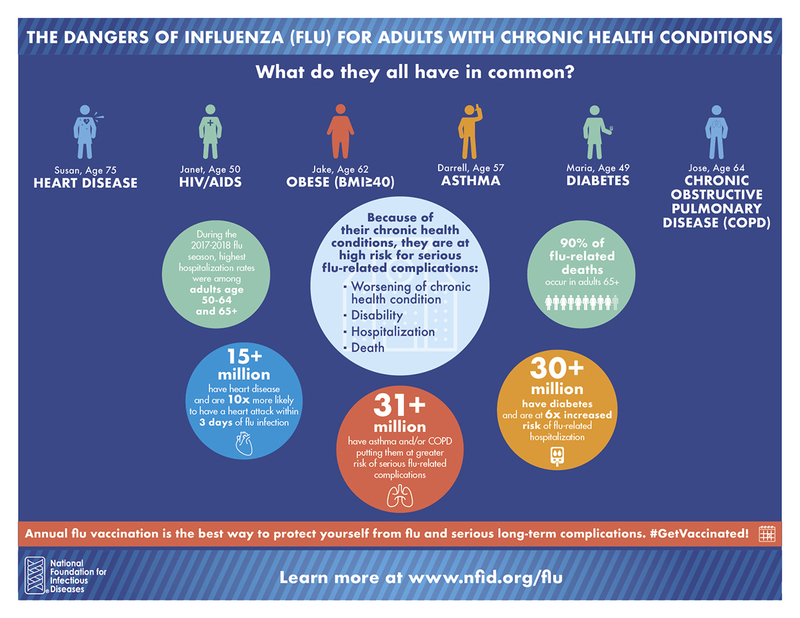 Estimates indicate that 31% of U.S. adults age 50–64 and 47% of those age 65 and older have at least one chronic health condition that puts them at high risk for flu-related complications, including hospitalization, catastrophic disability, and even death. Access NFID's Flu and Chronic Health Conditions online toolkit. Influenza season is now under way. CDC stated in its Weekly U.S. Influenza Surveillance Report, FluView, that as of the week ending December 1, the geographic spread of influenza in one state was reported as widespread; nine states reported regional activity; 18 states reported local activity; and the District of Columbia, Puerto Rico, the U.S. Virgin Islands, and 22 states reported sporadic activity. No influenza-associated pediatric deaths were reported this week; five influenza-associated pediatric deaths have been reported for the 2018–2019 season. Last season, there was a record-setting number of pediatric deaths in the U.S. (172), so be sure to protect all your patients for whom vaccination is recommended. A reminder that earlier this year, CDC updated its web-on-demand vaccine storage and handling video, Keys to Storing and Handling Your Vaccine Supply—2018. This training video is designed to decrease vaccine storage and handling errors by demonstrating recommended best practices and addressing frequently asked questions. Continuing education credit is available until April 18, 2020. IAC's 2-page ready-to-print resource: Don’t Be Guilty of These Preventable Errors in Vaccine Storage and Handling! CDC published Public Health Response to an Avian Influenza H7N8 Outbreak in Commercial Turkey Flocks—Indiana, 2016 in the December 7 issue of MMWR. A summary made available to the press is reprinted below.